When it comes to protecting your online reputation, it’s important to cover all of the bases. In addition to knowing what others have said about you or your company online, you also need to be aware of the various platforms where others may have made comments, such as blogs, Facebook, Instagram, YouTube, and more. Doing a “Google search” can help you to see what information is out there online so you can figure out what you should do to control it — but don’t think a simple Google search is enough to keep you safe and protected. According to an ExecuNet survey, 90 percent of executive recruiters report that they type a candidate name into an online search engine to find more information beyond what is on the executive’s resume. As a result, 50 percent of recruiters have eliminated an executive job candidate because of information they found publicly available on the Internet – up from 26 percent in 2005. Guest what? The same is likely happening when a potential business or client is looking to advertise or invest in your marketing services as well. This is why it’s extremely important to make sure your personal and brand name have a great first impression online at all times. Here are seven ways to accomplish exactly that. The old saying, “An ounce of prevention is worth a pound of cure” applies here. 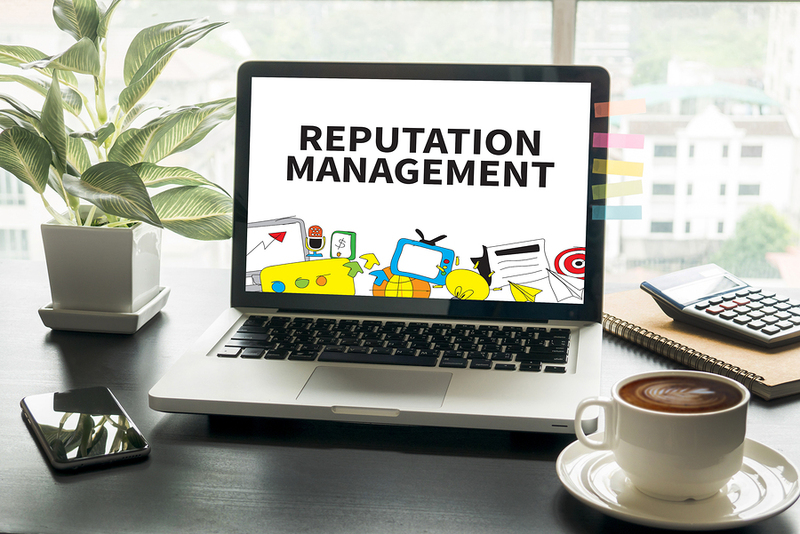 You need to be proactive when it comes to your online reputation – this includes owning and controlling domain names relating to your name, your company and your key products and owning and controlling the social media properties relating to the same. In a world of data protection and personal information floating around every corner, you will also want to make sure your email marketing and newsletter data is fresh, safe, and opt-in. This is especially true with the new GDPR regulations going into effect. Not only can paying customers provide a nasty review or damaging the first impression to your brand online, a disgruntled newsletter subscriber who can’t seem to unsubscribe can cause just as much damage! Check search results for your name, and if you own or manage branding for a company, look up your company name and key products frequently, especially social media profiles or blogs where you have enabled user comments. You should consider whether to respond to or delete any negative comments right away so that you can control what others can see about you and your company. Just a few negative comments can wreck a great startup and hamper the chances of making it a success or derail a potential lucrative job offer or partnership opportunity. If customers know you are going to be monitoring your social media comments closely, they may be less likely to write negative comments. Another recommended tip is to make sure your brand or business is currently listed with any business or marketing review sites online. Since these directories usually rank pretty well in Google, it’s likely they will rank for your name as well. Take the time to make sure that your business is listed, and has some positive feedback from previous customers as well. There are often two extremes when responding to negative online reviews. Some business owners respond very defensively to online complaints, either attacking the customer personally or making excuses. The other extreme is acting too deferentially, publicly accepting full responsibility when it is best shared or accepting the blame for something that is an aberration or a rare occurrence, like a hair that might fall into a bowl of soup or an order mix-up, with an over-the-top apology that is best suited for international diplomacy rather than a Google review forum. Generally, the best approach for a business is to have a conversation offline to discuss the issue. The best response is when the owner or manager reaches out to the individual who posted the complaint in near real time, expresses an interest in resolving the issue and provides contact information so this resolution can actually take place. There are some effective reputation management and online monitoring software available to locate and delete material that can be harmful to you or your company’s reputation. SproutSocial, Synthesio, Hootsuite even Salesforce offer social listening and online monitoring solutions for individuals and any size business. Tools like Google Alerts are also great for finding new information that might index in the search results, but using this tool alone will miss out a great majority of content on the internet. To protect your reputation online, you must be actively monitoring in all locations. One way to find out what is written and said online about you is to do a Google search for yourself. Type in your company name or your first name and last name (including variations and city, depending on what you promote the most and see what comes up. If you have been online for a long time, there may be a large number of entries associated with your name, including posts you made on various social media, forum comments, and blog posts. Also, don’t forget that Google isn’t the only search engine in the world. Yes, it might be the most popular, but there are still millions of searches taking place daily on sites like AOL, Bing, DuckDuckGo and many others. If you don’t use third-party software for monitoring your reputation or you discover your online reputation has taken a hit, you will want to contact an online reputation management company with experience suppressing or removing negative content online. Again, just like we talked about how other businesses and clients might be searching for your name and reviews online, the same should be done with any potential ORM services you might be looking to hire. Practice what you preach. For any businesses or brands with an active email list, this should be quite easy to accomplish. Sending out a short survey to your audience and offering a coupon code or discount for their time is a great way to incentivize the process. Just make it clear you are providing the reward for the time to take the survey and not for a positive review. Working on your branding can help you improve your overall reputation, as well. When your brand stands out positively, you can counter negative comments by the strength of your brand. Video content – whether featuring your customers or executive team – can be very effective in promoting your brand. Social media is at the heart of your online reputation. However, email marketing is one of the most powerful security methods of all. With an in-house mailing list, you can have direct contact with your audience and customers first. Should there be a PR disaster or media attention on your brand, it would be priceless to get in touch with all of your loyal customers and address the situation directly. At the same time, growing your mailing list size and making sure you continue to bring in new customers and leads daily is key. SEO and search are great for this, but it’s also one of the slowest methods of traffic generation out there. With 100% opt-in email marketing and AfterOffers, businesses and brands are growing their lists by hundreds of new leads daily. Contact us today to learn more about how to grow your brand and business through the power of 100% opt-in email marketing and lead generation.